Whoa, that's very deep, Maxie! Wow, that is something I never thought of! Oh nooos, Maxie I'll never going to sleep again wondering about where boxes come from. I just know when Mommy and Daddy order stuffs from Amazon we get a new box. So I wiill think about that, so I can sleep. Heaven? We've never seen it raining boxes, but that's what we'd expect. We agree with Ducky (Amazon seems to just send us boxes sometimes), but we also know that TBT brings some sometimes in the noisy machine. Mebbe they all come from the farms where Beins grow stuff; treats, chick-hens, beefs, boxes, etc. Some of them come from the brown truck man. Others come from the white truck lady. And still others, I've been told, come from Chewy. Tee hee hee. Most of mine come from the Amazon. 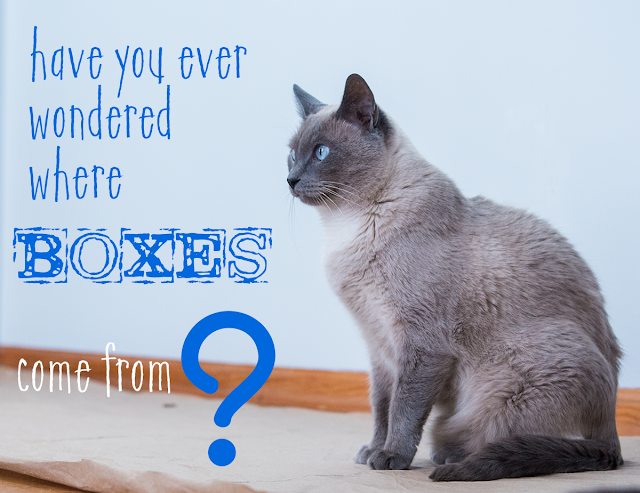 You are thinking well, Max, purrhaps they come from box factories! One summer petcretary had to work in a factory and she made boxes! Big ones, and small ones...she got to put big evil staples in them to keep them together...no really! Yikes!